To this day I can't bring myself to spend tons of money on brand-name cosmetics no matter how wonderful they claim to be. Diamond-infused lotion? No thanks. Caviar face mask? Um, pass. Regular old mascara that's marked up way too high so you check the other ones right behind it just to make sure it's not a mistake only to discover that it is in fact overpriced? Argh. Plus, I'm so picky (and my skin's so sensitive) that it could very well get a one-time use before it expires. But when I get into girly mode, I do like having different options and colors to choose from especially when it comes to eye shadows and nail polishes so I usually head to local drugstores to find bargains there. Well Essence Cosmetics, a popular European brand that recently made its way to the United States via Ulta, offers trendy products at super cheap prices. So if you can't choose between this lip gloss and that bronzer, you don't have to worry about making a dent in your pocket if you go for both. (The subtotal is less than five bucks.) The company definitely seems to aim towards the younger crowd with their shimmery colors and nail art, but they also sell beauty tools that come in handy no matter how old you are. And starting in October, they'll be expanding their line with new shades and products for everything lips, eyes, nails and face, which is good because they could definitely bulk up their current U.S. offerings. 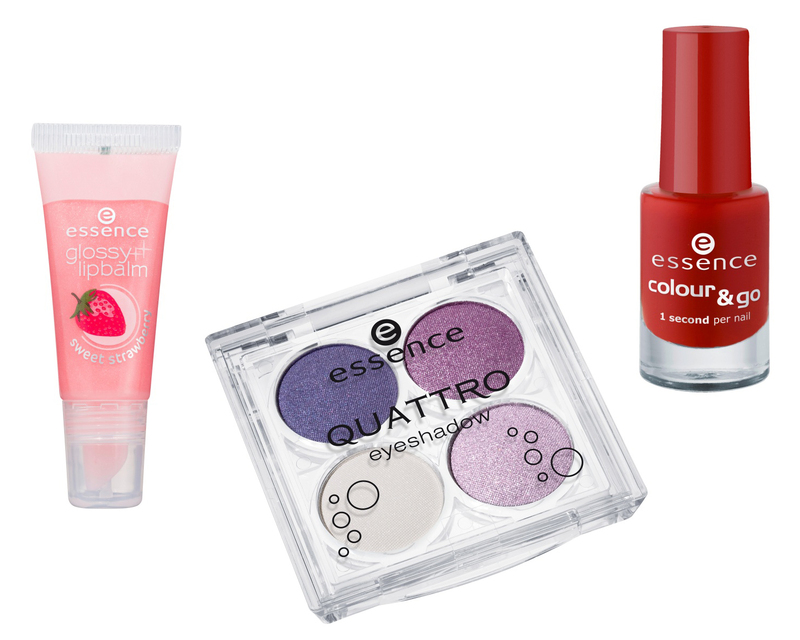 This week, one of you will win a Glossy Lipbalm, Eyeshadow Quattro and Colour & Go Nail Polish in the colors of your choice. Just visit the site, take a look a round and leave a comment below. A winner will be announced on Friday! I love both of Essence's Smokey Eyes Sets :) *Thanks* for the giveaway! I love that they don't test on animals! Ohmygosh - love it!!!!!!!! Makeup is something I'm totally a junky with and what fun (AND CHEAP!) products they have! I used to sell Ulta cosmetics wayyy back in my ancient mall days, lol! I love it all, but bronzing pearls - yay!, the powder blush duo - yay! and how about some glitter eyeliner for the holiday!!! I'm lovin' it! WooooHOOO Yeah!! Give it to me baby.